More than 1200 people gathered in Castle Square on Saturday 29 October, to create ‘River of Lights 2016’, a celebration of Pembrokeshire’s County Town and its links with the rural communities that it serves. Meeting at the Lab in Haverfordwest at 6.30pm to light the lanterns, the procession, accompanied by music, set off at 7pm winding its way through the streets, along the river and through the parks to a spectacular finale on Fortunes Frolic. River of lights 2016 from curious ostrich on Vimeo. The procession was inspired by the medieval story of the ‘danse macabre’, where Death brings his subjects back to life for one night only to have a glorious party! The 2016 event was a partnership between Confluence partner, spacetocreate, SPAN arts Cheerful project and lead artist Toby Downing. Music was provided by the fantastic Pete Stacey and friends and the fire drawing finale and pyrotechnics were created by Lee Berridge and Pembrokeshire Fire Spinners. We were there! It was very cool to see so many people participate and the giant skeletons were amazing and when we were up close to them we were actually freaked out even though we knew it was a puppet!!! 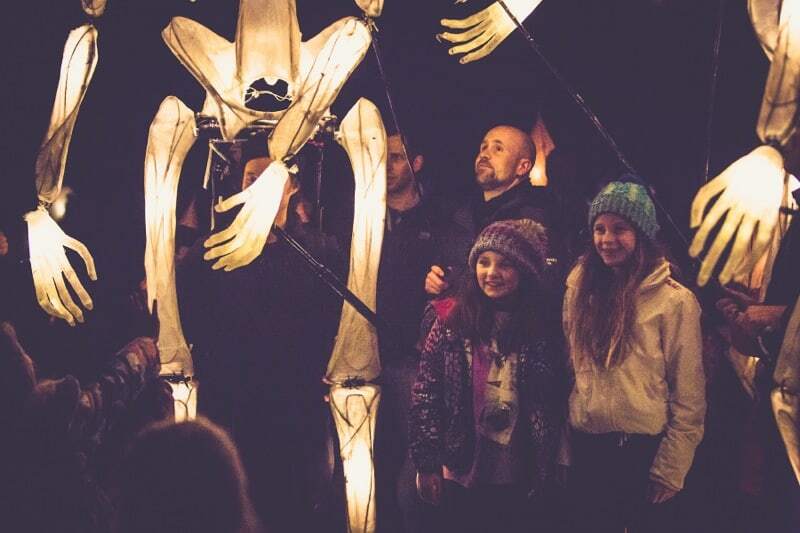 All the people in Haverfordwest were peaking their heads out of windows or coming out of pubs dressed up in their Halloween gear looking at this lovely procession of lights with two f off massive skeletons. The magical short film documenting the procession was created by Sharron Harris with the help of Geraldine Murphy and the fantastic set of photographs of the finale shown here were taken by Jennie Caldwell.